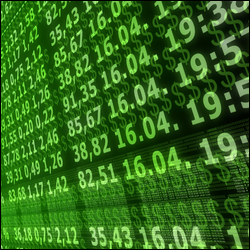 There's been something of a buying frenzy on the indices CFD markets in recent days. It hasn't been solely down to optimism in the run up to the EU summit and the continuation of that following Wednesday's negotiations, but corporate earnings have been relatively strong on the whole. This morning the UK 100 index is adding to the gains of recent days and is well on track to record its second best monthly gain ever. A remarkable feat when you consider that at the beginning of October there was a feeling that we might see yet another typical mass sell off as we have so often in the past. The first few days started very nervously as the UK 100 fell 3.5%, so if we hadn't seen that then we'd probably be saying we're on the verge of recoding the best monthly gain in the index's history. This morning the index is happily drifting higher trading at 5744 as the appetite for risk remains insatiable. So has the European sovereign debt crisis been averted? That question will be asked again in two or three year's time when Spain and Italy have to roll over their debts. Vast sums of money have been lent to them to the tune of nearly €1 trillion to Italy and half that for Spain. Throw into the mix the already bailed out PIIGS and any other possible future bailouts and the leverage of the existing EFSF to €1 trillion looks a little in significant. The announcements yesterday were nothing more than that with the only thing that was agreed being the recapitalisation of Europe's banks to the tune of just over €100 billion. At least our own banks come away from this with a bill of clean health as they won't need to partake. CFD investors are still seeing lots of loose ends that need tying up and, even once they are, there's still no guarantee that this will have resolved the crisis altogether. If the heavily indebted European nations are still uncompetitive and struggling to grow in a couple of year's time, even sooner perhaps, then they will be engulfed by their debts and we'll be back to square one again. This time however it will probably be either Spain or Italy that will be the defaulting nations. Growth is going to be the key to helping us get out of this mess. As we should have learnt by now, growth is not sustainable or even viable by simply borrowing more. Growth starts with confidence so at least yesterday's talk might create some clear blue water so we now know where we all stand, even if the finer details still need to emerge. But that confidence seems a long way from coming to the UK's shores. If you were to open the papers today, all you would see is negative headline after negative headline. Claims that the European deal is a fudge and not enough, job losses across all sectors and falling output in our factories. Now that much of the European issue is out of the way, at least for the next year or so, we can markets focus on other things. That means back to the same old sluggish UK economy story, protests and yes, 'let's blame it on the government cuts'. GDP numbers from the US will be closely watched today with a jump expected from 1.30% last quarter to 2.40% so at least there's a bit of good news across the pond. We also get the weekly jobless claims and some pending home sales data which might lead to a little movement in US indices later. This morning, the UK 100 is continuing to hold above the 5500 level despite the weakness seen on the US markets last night. We are seeing a certain amount of selling from our CFDs clients but the jury still seems to be out ahead of the outcome of today's summit. The big question for today is whether today's summit will provide the catalyst for the next major move to the downside. So as we await the outcome of the meeting, we can also check up on corporate earnings which remain in rather good shape on the whole. From an economic data point of view it's another day that is dominated with US releases as we get durable goods and new home sales around lunch time London time. We had expected to see the FTSE have a bit of profit taking this morning and, whilst the index did open slightly lower, it has been quick to bounce back to where it left off last night. Oil majors are assisting the buyers following better than expected earnings from BG and BP and for once it would seem that investors are focusing on decent corporate news. But of course the market isn't really as the overriding issue remains how much of a write down private investors will accept on their Greek debts. The losses incurred amount to billions and the resultant recapitalisation of banks required is going to make the recent bout of austerity measures announced across Europe look like a bit of a picnic in the park. Lending will likely get frostier and frostier as investors ask "if I'm going to lend to Greece and lose over half my investment then why should I lend to Spain or Italy?" As the battles and discussions go on behind the scenes, markets remain optimistic that the plans will be enough to prevent contagion and an EU catastrophe. The FTSE's two and a half month high has been attracting CFD account holders to sell into the index as they remain doubtful of a distinct and lasting resolution. The markets remain hopeful that Wednesday will bring the answers to all our prayers as investors give the European politicians the benefit of the doubt. Headlines over the coming days will be filled with little other than the discussions and for now the UK 100 is content hovering around the 5500 level. We were calling the index to open up higher around 5540 but by the time we came to commence trading some 30 points had been knocked off our call. In the near term, the stock market is struggling to get above and beyond the highs it formed exactly a week ago. Fears of a mini double top formation on the hourly chart are encouraging some of our account holders to short the index. PMI surveys from Germany and the EU will be keenly watched today, in particular the German ones which are expected to show manufacturing and services have just dipped below the 50.0 level which suggests contraction. Often you wonder whether politicians read the papers and, if they do, whether they flick through the financial section. It seems incomprehensible that they can still be at logger heads about how to deal with the European sovereign debt crisis when the situation is escalating and becoming worryingly nerve wracking. Now Germany is seeking more time and wants to delay Sunday's decision making until next Wednesday. This takes us tantalisingly close to what many of those spread trading on indices see as the deadline which is the next G20 summit at the beginning of November. Unfortunately, as regularly mentioned in the past, politicians are only really interested in one thing and that's peoples' votes. This is why they will always find the hardest decisions, which are usually the most unpopular, impossible to make. Such decisions risk an incumbent government's position in power or the loss of an important majority they may hold to pass legislation. We are seeing Germany's reluctance to commit and take a lead on the Eurozone crisis because Chancellor Merkel's majority is rather slim. In the last crucial German vote on the extension of the EFSF's powers she only just won. Any agreement in the coming days will require further votes and next time the support may not be there, as we saw in Slovakia. Interestingly, even though the outcome of this weekend's summit is under threat from further delay, the UK 100 is a little higher on the open this morning. Strength from US stocks yesterday is the main reason for this, but you would normally expect weakness to be setting in as the EU calendar is shifted again. This further extends the bout of uncertainty and, between now and then, it seems hard to see that the UK 100 will make any meaningful gains, even if it did breakout to the upside beyond 5400 a few days ago. We were calling the UK 100 to open a few points above 5400 which it did but already we're seeing the index falter a little and test just below here. European leaders continue to try frantically to agree on a resolution for the EU and are running against the clock. It has even come to the French President missing the birth of his first baby with his new wife in order to try and quell the growing concerns. Whilst bank after bank and country after country receives a credit rating review or downgrade, investors are getting even more jumpy and nervous ahead of the weekend. It is difficult to focus on little else and it feels like this comment has been talking about nothing other than the Eurozone for some time. Corporate earnings on the whole has been good with some bright spots from Europe, even if they are very much emerging markets stories, and the UK's highs street has seen Debenhams come in with some decent numbers too. But all this is brushed aside by the overriding crisis unfolding on the continent. We can probably thank our lucky stars that we are not part of the euro; however it is hugely important for our own economy that the economic block remains stable. If our biggest trading partner was to spiral into a recession, and bring its banking sector with it, then the ramifications for the UK would be considerable. All the money that's been thrown at the problem so far would be piecemeal compared to the worst case scenario. Investors remain nervous and we can see that this morning with the FTSE down some 75 points to 5375. The stock market has found a little bit of short term support however around this level which is where we bounced off on Tuesday. A break below here could open up the way for 5300 and below, meanwhile advances are capped by 5520/55 and then 5600. It's hard to see much movement away from the narrow trading range that has developed so far this week until investors can be surer of what lies ahead for the Eurozone. This morning sees retail sales from the UK which are expected to bounce following the riots. The stock markets seem to be expecting this to be more of a flash in the pan as opposed to a change in the longer term trend for the high street. Consumers are still feeling the pinch and the longer term prospects for retailers looks tough. At least many of the clothing shops will be happy that winter has finally arrived so they can shift their enormous stock of jumpers. Already this morning's rally, on the back of a good session in the US and Asia overnight, is having its resolve tested. On our trading platform we started at 5450 and are now drifting slightly lower, but not by much. The rallies continue to remain hard to come by and it seems impossible to see the FTSE getting back to the dizzy heights of earlier in the year without a thorough and convincing solution to the Eurozone debt crisis. The visit to above 5500 seems like quite a hurdle to get back over but if the bulls can muster the momentum to get back above there their next target will be 5600/50. To the downside, support for the stock market index is seen at 5345, 5260 and then the biggy at 4800. Bank of England minutes are released this morning so it'll be interesting to see just how many of the MPC members joined the increase QE camp that Adam Posen has constantly been in. Later today the US will release their inflation data and then there's the Fed's Beige Book in the evening so there might be some excitement later on in the day too. The build up in confidence of the last few days has been quashed by comments from Germany's finance minister that markets should not expect any definitive resolution to the sovereign debt crisis this Sunday. That's not what the bulls had been hoping to hear who've been buying equities in the build up to this weekend's critical meeting after the noises from EU politicians had been that they were going to resolve the situation. Having worked so hard to break above the major resistance level around 5400/35 after so many attempts, there was belief that this was a break out to the upside for the FTSE market. However, it has turned out to be a very short lived break out and we're now back below the 5400 looking like we could continue the weakness that's set in so far this week. The selling is also being compounded by poor GDP figures from China which dipped to their weakest level since early 2009. This bashed up Asian stocks and in particular the mining sector in Australia's session so they are littering the biggest losers this morning. Also, it's Moody's putting France's prized triple A credit rating on negative watch that is getting the bears out in force today. The bond yield spread between France and Germany widened yesterday meaning that even Europe's second biggest economy isn't immune to a possible attack by bond investors. All this is adding to the negative mood on the CFD Trading markets this morning and things might not get any better when UK inflation numbers are released later this morning. And the markets are flying high once again. Despite nothing but rhetoric coming out of the G20 meeting at the weekend (did you expect anything else? ), CFD trading investors are continuing to buy equities ahead of the key European Council summit this coming weekend which is expected to reveal the answer to all our problems. Looking at the InterTrader prices, the FTSE is well above the 5500 level at the time of writing having opened higher and already this morning is adding to the gains. Now that the index has overcome the 5400 barrier the next targets in sight for the bulls are 5555 and 5600, with 5600 likely to be a more stubborn level since this was past support for the index. There's little in the way of economic data due out today except from the US there's Empire manufacturing and the industrial production which might add to the bullish tone for stocks if they come in above expectations.